Birthday is always a great occasion to show your respect and gratitude to your teacher. 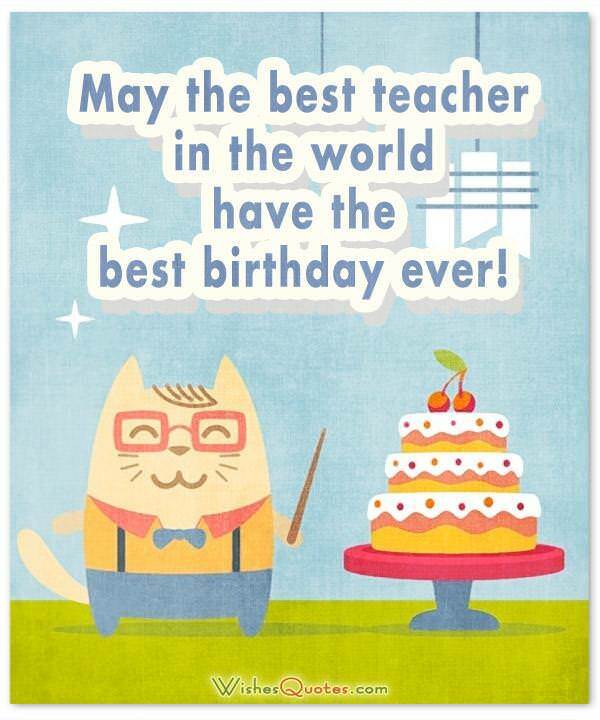 Take ideas from these birthday quotes, funny messages and heartfelt words to write an unforgettable card on your teacher’s birthday. Teachers, when met by a student at the grocery store, sometimes get a surprised look. It seems they are thinking “Teachers actually eat food?” Sadly, we tend to take our teachers for granted. Teachers show up every day, lesson plans in place, trying to help sometimes reluctant people. Although we don’t need an excuse appreciate all they do, their birthday is the perfect time to thank and encourage these mentors. The entire class as a whole or one student at a time, a simple note of gratitude is welcomed warmly. Accompanied by a gift (or not), these heartfelt words remind him/her of the reasons they wanted to teach in the first place; the vehicle (email, paper, banner) doesn’t matter. The following examples of thoughts will inspire your own sentiment. Hey, teacher! Have I told you how much I appreciate everything you do for our class everyday? No? I need to fix that. Thanks and Happy Birthday! You are the best teacher EVER! I really mean that, and I don’t expect an “A” in return. I mean, you can if you want to…. (Happy Birthday). Roses are red, violets are blue, Superman’s a hero, and so are you. On your birthday, and every day, thanks. I have to admit, I really hated your class at first. But, with your caring and effective teaching style — I learned so much. Happy Birthday. When I think back on my college days, you will always spring to mind. You taught, encouraged and laughed along with all of us. Happy Birthday. Truly effective teachers do it in such a way that the student doesn’t realize he’s learning. 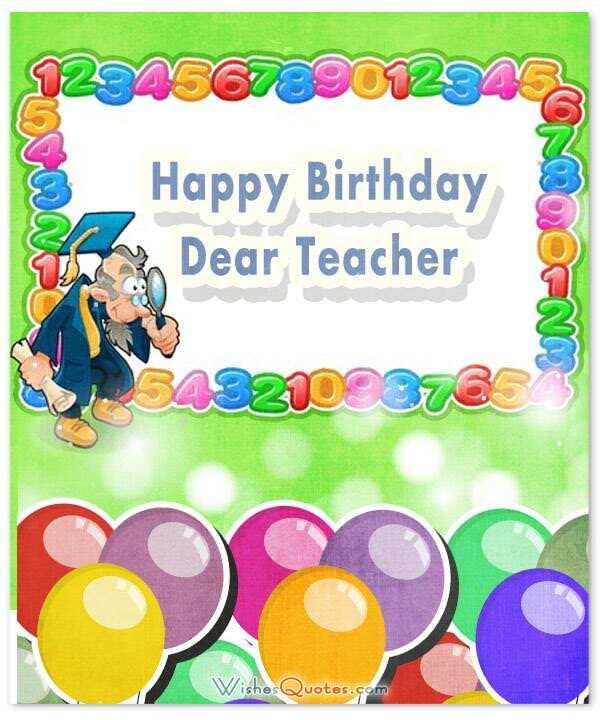 Happy Birthday to THAT teacher. With tremendous power comes tremendous responsibility. On your birthday, we want to tell you how well you handle it. I realize I wasn’t always the most well-behaved student, but you knew just how to manage my stubborn will. Happy birthday and thanks. We all want to thank you for your smile — every day. You make learning fun and we hope you have an awesome birthday. Leader, Teacher, Inspiration, Coach, Mentor, Protector and now Birthday Girl. You do it all! Teacher, you are the reason we look forward to coming to school every day. This is a Happy Birthday, but also a Thank You from all of us. I know you were aware that there was a lot of partying going on while I was in college. But, I DID learn — especially from you. Happy Birthday. Books, computers, uniforms, sports, gossip, puppy love, homework, tests, AND the best teacher in the world. Happy Birthday. At the risk of getting too mushy, I want to use your birthday as an opportunity to thank you for all you’ve done for me, both scholastically and emotionally. I didn’t think so at the time, but the writing skills you taught me really helped me in job hunting, career and life in general. Happy Birthday (and thanks). Happy Birthday! Oh, by the way, did you know that you’re the best professor on the planet? See, I DID learn something! You do so much more than teach. You are an inspiration in the way you relate to your students and the way you conduct your life. Happy Birthday. On your Birthday, I just want you to know that you have left an indelible mark on my life. Thanks for everything. You’ve opened the drawbridge to the influx of knowledge, so that I know in sight is a future that’s bright. Thanks, and HAPPY BIRTHDAY! 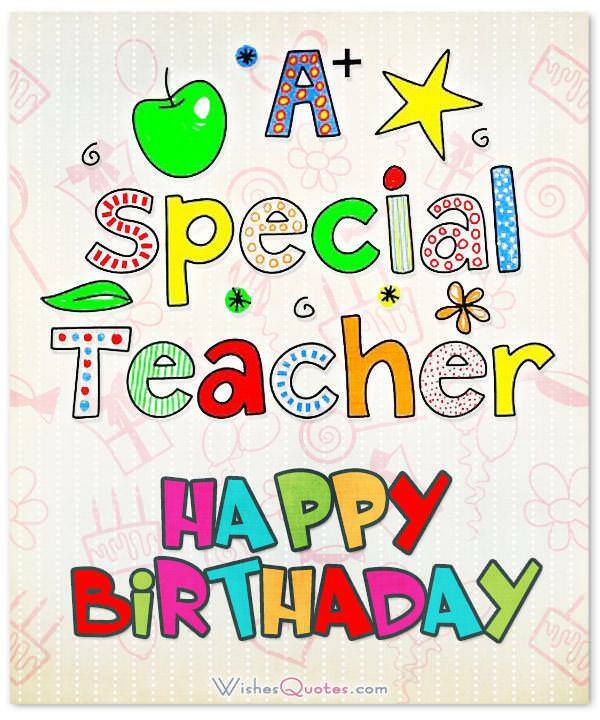 Dear Teacher: Although we sometimes get under your skin and don’t settle down when we should, we wish you a happy birthday and promise we’ll try to be good. Some teachers improve your test scores. Some teachers improve your life. Happy Birthday to a teacher who does both. I don’t know how any professor can come to work every day and teach so well with such passion. Happy Birthday — so glad to have learned from you. For some, they consider teaching their job. Others, like you, consider it their life’s calling. Happy Birthday with gratitude. 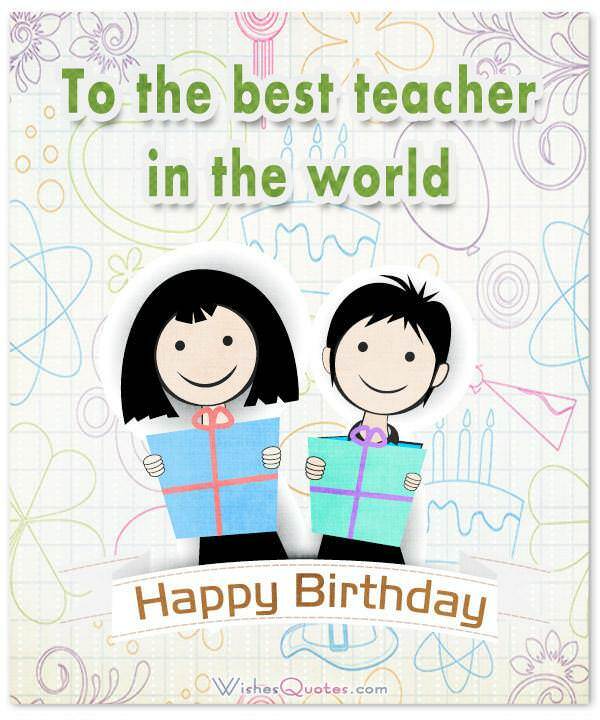 To my teacher on his birthday: If I could give you an apple, it would be the shiniest freakishly big apple on earth. Happy Birthday Teacher! Just for today, we promise not to yell or throw spitballs. Tomorrow it goes back to normal.